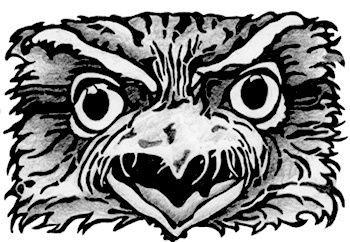 These three sketches illustrate similar subjects of eyes/face of the tawny frogmouth but I have used different mediums. The first is a simple sketch using graphite pencils. It is a simplified and more illustrative style in its approach with the thought of perhaps extending it into a linoprint design or illustration. It was about capturing an expression which is fairly dramatic. This second quick sketch uses watercolour pencils – they contain hardened watercolour paint which you draw onto the paper and then add water. It reminds me a bit of those children’s colouring books where you add the water and magically a watery colour appears. This is a bit more sophisticated though! This basic sketch idea aims to add colour to the graphite sketch ideas I had been working on. 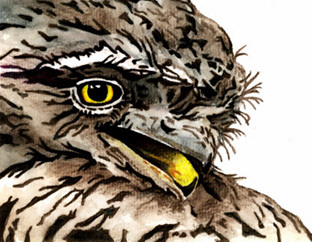 The bright yellow inner mouth and eye add the drama – much like the Tawny Frogmouths themselves! In this third sketch I have used some new charcoal pencils I picked up the other day in the art supplies store that I had a bit of a play around with. Again this is a quick exploratory drawing. I love working with willow charcoal so the lure to try out these pencils was too great! They were lovely to use with the only disadvantage being they tend to break frequently. 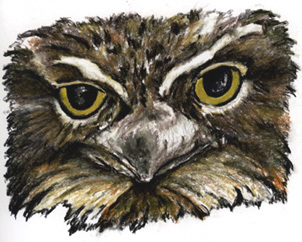 I was able to capture a bit more of the ‘texture’ of the tawny frogmouth which is nice. I will definitely be working with these a bit more. I love your tawny drawings! I’ve been a big fan for many years and are now studying the species for a PhD here in Melbourne. So lovely to come across other froggie fans. Hello – so glad to get a message from another Tawny lover!! They are really my favourite bird – it must be fascinating studying them. I love it every time I hear the local ones calling at night.